Friday morning started out rather nicely. It was one of those days where it wasn’t too difficult to get out of bed, I was able to drive down my street and pull out on to the main road without any traffic, and there was no line at Espresso Royale. Work was quiet but I had a steady stream of at least moderately-interesting tasks to do. Even though it sucked being at work most of the week when so many people were taking time off, there are perks to staying in town when so many people leave! Like the ability to play Pandora in my cubicle loudly without anyone judging me. I’ve just glad that we still have our power; so many in the city have been losing power this week. I’ve been having serious sushi cravings this summer. I ventured out for lunch at Biwako Sushi on Friday. This was probably unnecessary for lunch, but we started with an order of gyoza, along with miso soup, and salad with ginger dressing. I appreciate I place and can get in and out of quickly at lunch on a workday, and Biwako was not that kind of place on Friday. The service, which used to be one of the main factors that kept me going back, was rather slow. 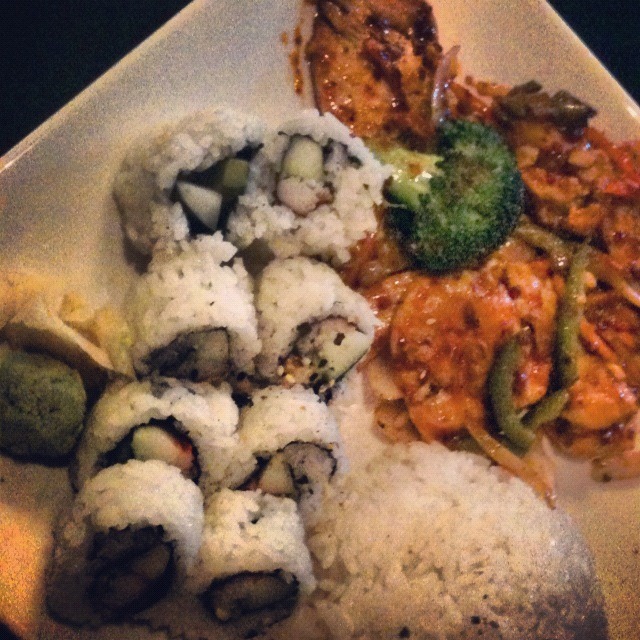 I ordered one of the specials of the day, a combination plate with Dak Bok-Um and a California roll. The Dak Bok-Um was a really tasty grilled chicken and vegetable dish in a tangy, garlic sauce. I like Biwako’s sushi but it’s not meaty enough for me. Currently I prefer Nagomi’s sushi over Biwako’s. It was also served room-temp, and I really like my sushi cold. Especially in this HEAT! For dinner all I wanted was a salad. Seriously, I have been craving cold, crisp vegetables hard this week. Dinner was at Grizzly Peak, where I have pretty much tried all the salads on the menu. 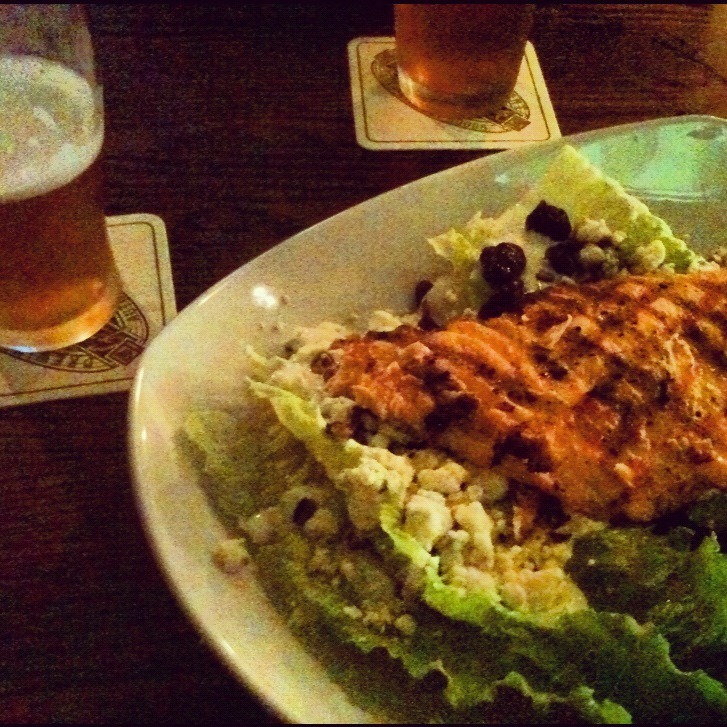 One I didn’t recall trying was the Hearts of Romaine Salad, with blue cheese, sweet, plump, dried cherries, and pecans, with an added cajun-crusted salmon filet. I seriously ate every single morsel of this salad; it was awesome. To drink, I ordered one of the beers served cask style, which was the Creamsicle El Hefe. This beer was really creamy and had an aftertaste that I think it would be fair to describe as orange creamsicle-esque. The creaminess kind of came across as bananas. It was interesting, to say the least, but I didn’t love it enough to stick with it for my second beer. For dessert we ordered one of our favorite Ann Arbor desserts: Black & Tan Brownie. Mmm, baby! 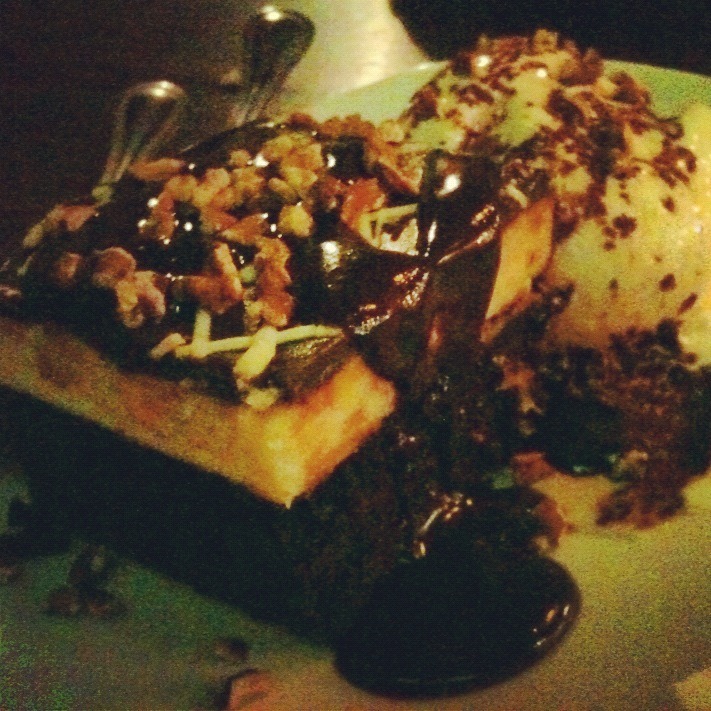 A cheesecake-topped brownie, smothered in chocolate sauce, pecans, with vanilla ice cream. Pingback: Meal Planning for June 7–June 13 « Meg.Goes.Nom.Nom. Pingback: Meal Planning for July 7–July 13 « Meg.Goes.Nom.Nom. 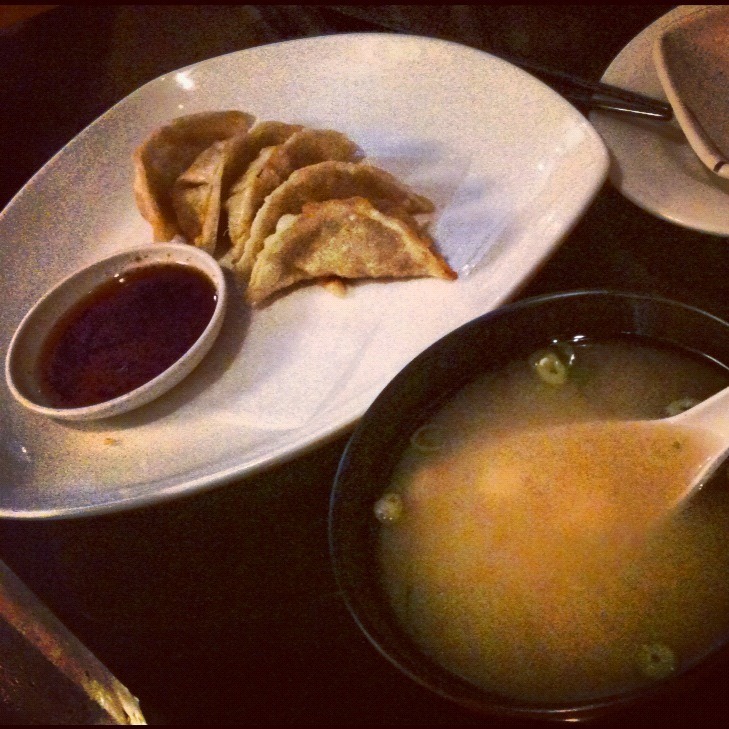 Have you been to Yotsuba for sushi? It’s my fave in the area 🙂 I haven’t tried the Black&Tan yet, but going to have to make an excuse to!